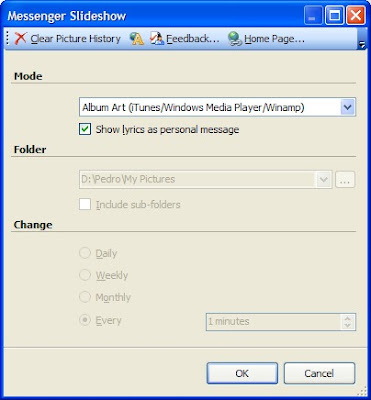 Messenger Slideshow allows you customize your Windows Live Messenger picture. Messenger Slideshow lets you use a random picture from your images folder, a screenshot from your desktop or the album art of the music you are currently listening as your Messenger picture. * Ability to use a random picture from your images folder. * Ability to show a screenshot from your desktop. * Ability to use the album art of the music you are currently listening (iTunes, Media Player or Winamp). * Show song lyrics as your personal message. * Uses Amazon and Google for album art and SeekLyrics for song lyrics.